​A quite literal walk off. 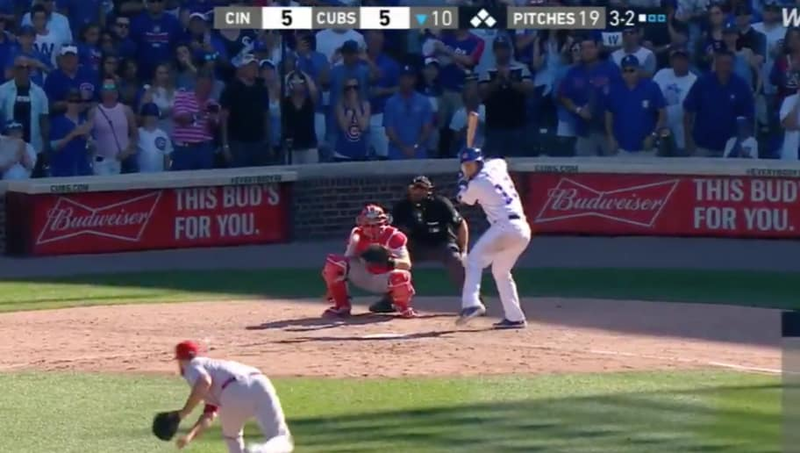 The Chicago Cubs blew their 5-4 lead in the top of the ninth after the Reds smacked a solo homer off closer Brandon Morrow, but it was David Bote, who used his impeccable eye, that came to the rescue. A walk-off walk for the 6-5 win! Need another angle of that sucker? We got you. The Cubs also trailed 4-3 in this one, which capped off another comeback victory for Joe Maddon's club. They scored six straight runs on Saturday to defeat Cincy 8-7 and capped off the series win on Sunday. Chicago is just 1.5 games behind the NL Central-leading Milwaukee Brewers now.